Profile: Galvatron is the new name and identity for Megatron when his remains are metamorphosized by Unicron. Galvatron is Megatron to the ultimate degree, more evil, more powerful, and even less subject to emotion or decency. 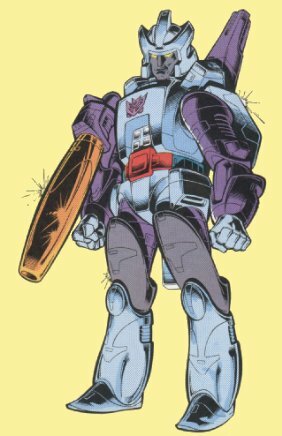 Through the powers of Unicron, Galvatron's own powers are augmented continuously so that his strength becomes so vast that his arrogance and confidence are boundless. As long as Unicron exists, Galvatron is invincible, but Galvatron's conceit and greed for dominance are so great he even plots against Unicron and hopes to retain his new might without him.